Microsoft released the new version of the Internet Explorer at a special press event yesterday and it’s being praised by developers, designers and early users as the biggest and best overhauling the browser has ever received. IE9 is faster than all its previous versions and now supports HTML 5 and CSS3. MS says that it’s focusing on “beautifying the web” and the new IE will provide all possible tools to revolutionise web designing. Google Chrome was the first browser to bring HTML 5 support and users and developers have been showcasing all the magic that’s possible with it. Now Microsoft is taking it a little forward and their browser is providing a much simpler UI which focuses on the content and not on its own appearance. If you open Bing in the new IE, you’ll get a glimpse of the new technology with moving backgrounds, hovering windows and search results that move with you as you scroll. It’s important to remember that IE9 is still a beta product and may crash and irritate initially. 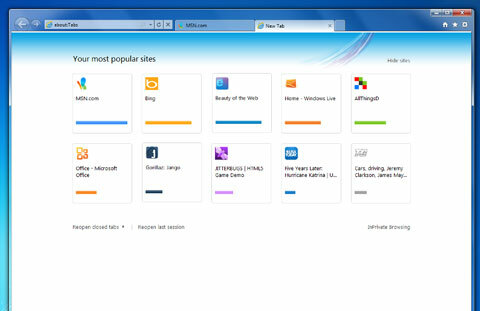 Microsoft has already launched the page where you can download the IE9 and start trying out the new features. Remember that it will only work on Windows with Bing loaded as the default page and that does not include Windows XP. So if you fulfil these pre requisites go to www.beautyoftheweb.com and start downloading. You can also check out the video below to learn more about the IE9 or read Microsoft’s blog post here.